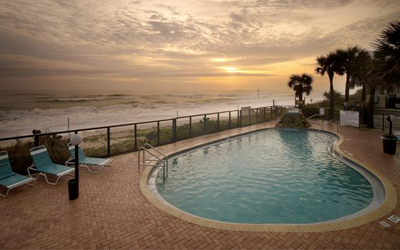 Enjoy March school/college spring break or Bike Week at the oceanfront Tropic Sun Towers Resort. Relax on your private balcony, by the pool, or on the beach. Experience nostalgia with a game of shuffleboard or work out in the fitness room. Rent a bike and ride the sands or make a run to Daytona, or surf/ body board to experience a true beach vacation. With ocean views from most lodging accommodations, you’re sure to take in the sensations of the wild Atlantic Ocean, while enjoying the property’s many amenities, including wifi wireless Internet. The features of Tropic Sun Towers are designed to provide all the comforts of home combined with an incredible yet convenient beachfront location, excellent amenities and personal service. The 2-bedroom villas sleep 6 people, and feature a master bedroom with queen bed and full private bathroom, a guest bedroom with queen bed, and a second full bathroom. The living room includes a sofa that opens into a queen sofabed. All holiday vacation rentals include a kitchen with full-sized refrigerator, range and oven, microwave, dishwasher, flatware, everyday china, cooking utensils and dining table for 6 people. We no longer own at this resort. Please contact us with your desired week and we will check our rental inventory. Tropic Sun Towers is located in the heart of Ormond Beach and is within a mile to a mile an a half of everything you’ll need while on vacation. The grocery store is within a mile, restaurants are less than one mile away, shopping is nearby and other conveniences are close by.